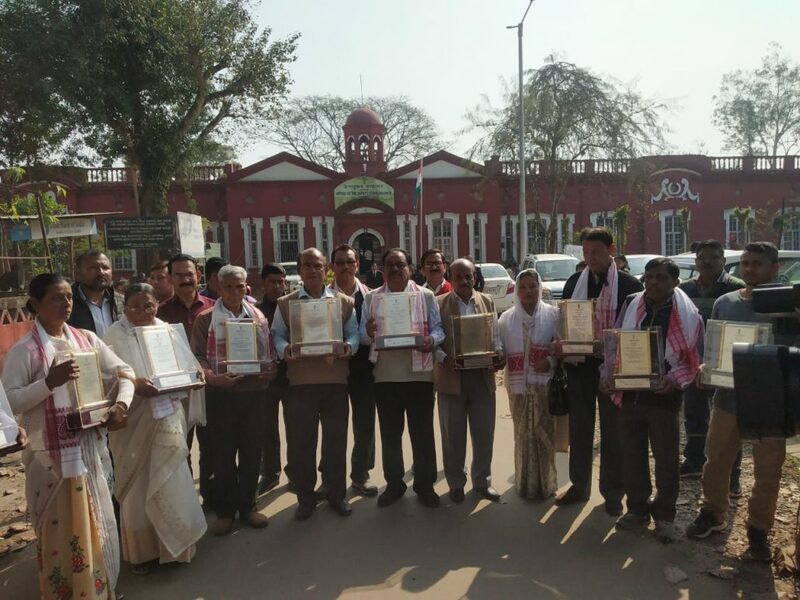 Eleven families of martyrs of the Assam Agitation returned the mementos awarded to them by the government in protest against the Citizenship (Amendment) Bill, 2016 in Jorhat of eastern Assam on Tuesday. The mementos were awarded by the government along with Rs five lakh cash to families of 855 martyrs all over the State who had sacrificed their lives in the six-year long Assam Agitation to oust illegal migrants mostly from Bangladesh which had begun in 1979 and ended with the Assam Accord in 1985. The move comes in wake of the appeal made by the president and general secretary of Sadou Asom Jatiya Swahid Pariyal Somonnorokhyi Parishad (All Assam Martyrs’ Families Coordination Council) to all the martyrs’ families to return the mementos ‘as the government had made a mockery of the Assam Accord and the unanimously accepted cut off deadline of March 24, 1971 as the detection and deportation of illegal migrants from Assam irrespective of religion, caste or creed by supporting the Citizenship (Amendment) Bill, 2016 which proposed to give citizenship to Hindus and other persecuted minorities barring Muslims from Bangladesh, Pakistan and Afghanistan’. President of the organization Rajen Deka whose elder brother Babulal Deka had been martyred told Northeast Now over phone from Morigaon that it was with a very heavy heart that the mementos had been returned. “Each of us have cried and have been deeply hurt by the stand which the government has taken regarding the Citizenship (Amendment) Bill, 2016 as there was no point in our kin laying down their lives for the security and protection of the State against it being overrun by illegal migrants,” Deka said. The first lot of mementos were returned by 76 families of martyrs who were represented in the central committee and the district, last Wednesday at a function held in Guwahati and was followed by other places. In Jorhat, 11 out of 22 families returned the mementos through the district development commissioner Geetanjali Dutta who is the in charge deputy commissioner. Chandrakanta Talukdar, the brother of the first martyr Khageswar Talukdar and the general secretary of Sadou Asom Jatiya Swahid Pariyal Somonnorokhyi Parishad had said that gradually, the other families would follow suit across the State. President of Asom Gana Parishad (AGP), Atul Bora said that the AGP stood behind the families of martyrs as the Citizenship (Amendment) Bill, 2016 was opposed to the Assam Accord and the sacrifices of the people who had died or were punished by being jailed or losing their jobs would be for vain. In Biswanath Chariali, 27 families and in Golaghat seven families had returned the mementos and on Wednesday, families of martyrs in Sonitpur district would return theirs.